Mild anxiety is a feeling of nervousness and stress that we all experience, often daily, and one way to relieve that anxiety is with a cup of herbal tea. While any cup of tea may promote relaxation, some herbs have been scientifically proven to help alleviate anxiety. 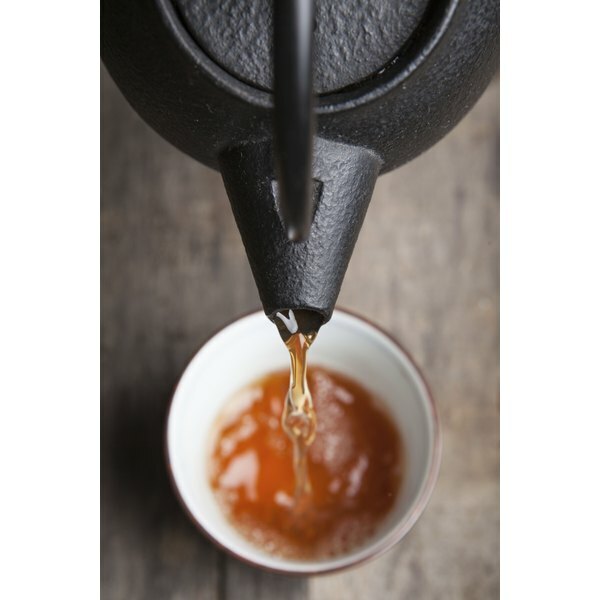 Choose your herbal teas from a reputable health food store or pharmacy. Known scientifically as Valeriana officinalis, valerian is an herb that is native to Asia and Europe, but is now grown in other parts of the world, including the United States. Valerian works by increasing the amount of GABA, or gamma aminobutyric acid, in the brain, which helps regulate the activity of nerve cells, thereby relieving anxiety, according to the University of Maryland Medical Center. Valerian extracts, particularly from the root, have a strong, unpleasant smell, so when it is made into tea it is often combined with other herbs to make it more palatable. One such combination is valerian and lemon balm. A study published in the February 2006 issue of "Phytotherapy Research" shows that when subjects were given a combination of valerian and lemon balm supplements, and then exposed to stress, the valerian/lemon balm combo helped lower stress levels. A word of caution, however, is that the same study found that when the subjects consumed high amounts of the supplement, anxiety symptoms were actually increased. Limit your valerian tea to one to two cups daily. Passion flower, or Passiflora incarnata, is grown in the southeastern areas of the United States, as well as other warm areas of the world. According to the National Institutes of Health, the active components of the passion flower contained in the aerial parts of the flower have sedative and sleep promoting affects. Passion flower works so well at relieving anxiety that a study in the June 2008 issue of "Anesthesia and Analgesia" recommends it be used as a regular preoperative treatment for those going into surgery. One cup of passion flower tea, preferably before bed, should be enough to calm the nerves and relieve stress. St. John's wort is one of the most extensively studied herbs, and it has been found to be effective in treating fatigue, anxiety, insomnia and pain, according to a report from Memorial Sloan-Kettering Cancer Center in New York. Like passion flower, the effective extract of St. John's wort is taken from the plant's flowers. St. John's wort not only helps relieve anxiety, but it also can relieve symptoms of depression that accompany anxiety and stress. In fact, a report from the Center for Complementary Medicine Research in Munich, Germany, states that St. John's wort is as effective at treating depressive symptoms as leading anti-depression medications. The report, published in the German edition of "Research in Complementary Medicine," also warns that St. John's wort is highly interactive with other medications, so you must inform you physician if you plan to use St. John's wort tea or other preparations of the herb.